The Alpha Chapter of Beta Phi Mu celebrated its annual meeting and initiation ceremony on Saturday, October 27, 2018 at the School of Information Sciences. The event was livestreamed and recorded. Twenty-five graduates were inducted into Beta Phi Mu. 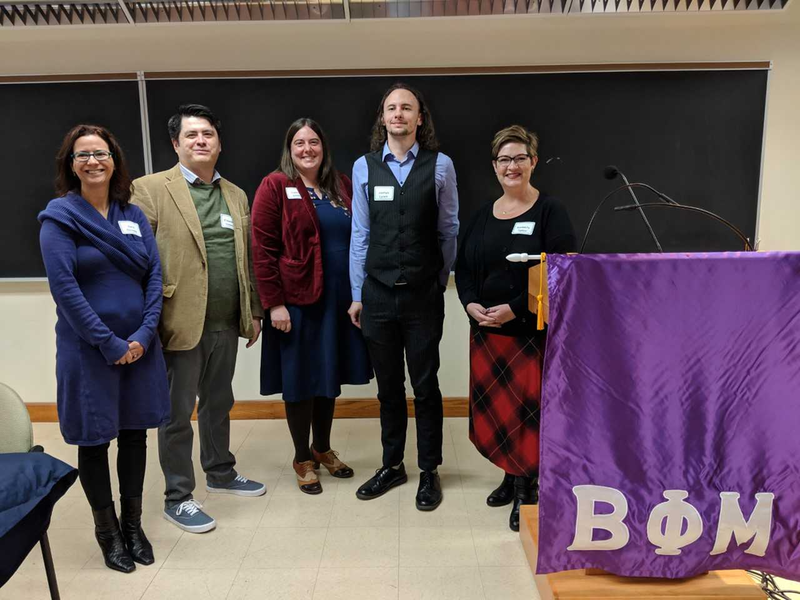 Five were able to attend and sign the Great Roll in person: Sara R. Benson (MS ‘17), Elisandro Cabada (MS ‘17), Joshua D. Lynch (MS ‘17), Cassia R. Smith (MS ‘18), and Kimberly L. Tipton (MS ‘18). Other business included: a report of chapter finances; a report on Beta Phi Mu activities at the national level; announcement of the recipients of two awards supported by Alpha Chapter: Opetoritse A. Adefolalu (MS ’17) as the Anne M. Boyd Award recipient and Joseph J. Porto (MS ’18) as the Kathryn Luther & William T Henderson Award recipient; and election of Paul Healey (PhD ’10) as incoming Vice- President/President-Elect. Following the ceremony and business meeting the members, new initiates, and guests enjoyed a luncheon. The event concluded with a talk by Lynne M. Thomas (MS ’99), Head of the Rare Book & Manuscript Library, University of Illinois at Urbana-Champaign, whose presentation was entitled, “The Accidental Time Traveler.” As a seven-time Hugo Award winner for editing and podcasting in the science fiction genre, she explored how her career intertwined rare books and special collections with Doctor Who and other science fiction.